In large bowl, beat cake mix, water, oil, eggs, cinnamon and nutmeg with electric mixer on medium speed 2 minutes, scraping bowl occasionally. Stir in carrots. Pour into pan. Bake 26 to 33 minutes or until toothpick inserted in center comes out clean. Remove cake from oven to cooling rack. 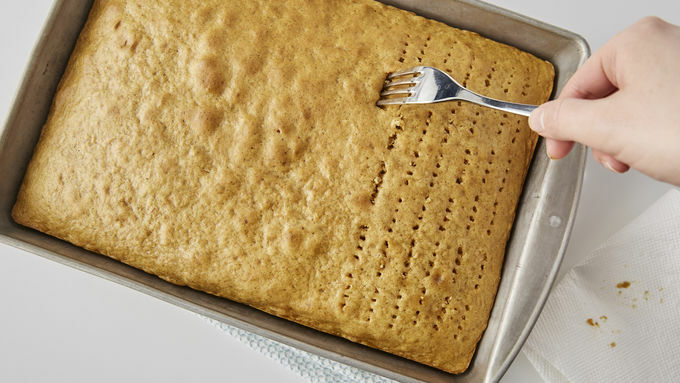 Immediately poke holes using fork over top of cake, wiping fork tines occasionally with paper towel to reduce sticking. While cake is still warm, evenly pour and gently spread 3/4 cup caramel sauce over cake, working back and forth to fill holes. Rap pan on counter several times to help caramel sauce flow down holes. Refrigerate 2 hours. When ready to serve, in large bowl, beat cream cheese and softened butter with electric mixer on medium-high speed until smooth. On low speed, beat in vanilla and powdered sugar until frosting is smooth and creamy. Drop frosting by spoonfuls; spread evenly on top of cake. Drizzle 2 tablespoons caramel sauce over top. Cut into 4 rows by 3 rows. Sprinkle with sea salt, if desired. Cover and store remaining cake in refrigerator. For an elegant presentation: After cake is finished baking, cool 10 minutes in pan; turn upside down onto serving platter, and remove pan. Immediately poke holes all over top. 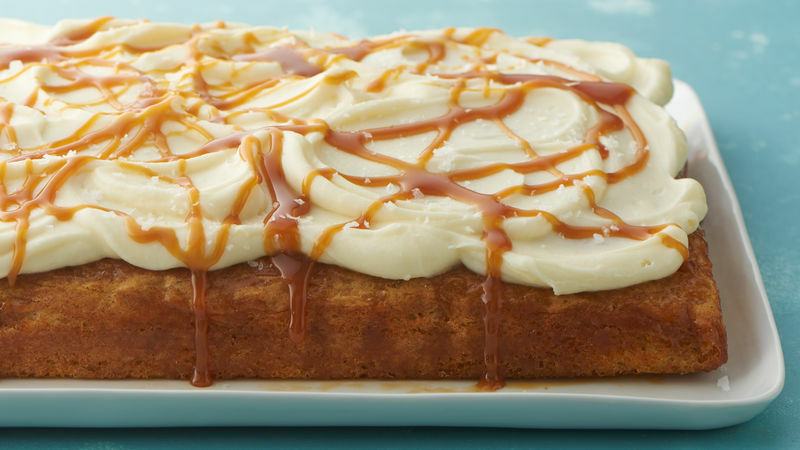 Pour and gently spread caramel sauce over top of cake. Continue as directed in recipe. For best results, shred carrots using the small holes on a box grater. Wipe down the fork tines as you poke the cake. If the tines aren’t clean, they’ll make larger “pokes” than you want and will make distribution of the caramel uneven. This cake is light and spongy, so the direction to gently spread the caramel is very important. You don’t want to rough up the cake’s surface by moving too quickly and risk pulling up the top of the cake. 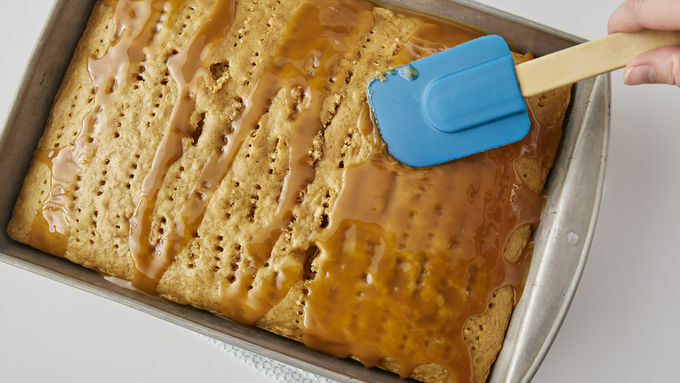 When you pour the caramel sauce over the cake, it’s much easier to fill and spread by going back and forth in a zig zag motion rather than dumping it all in the center and trying to spread it out from there. The cake will be warm and fragile when you do this step, so it’s best to reduce the amount of spreading to avoid damaging the cake. But if you do, you’ll be the only one who knows since there’s a tasty frosting that goes on top! 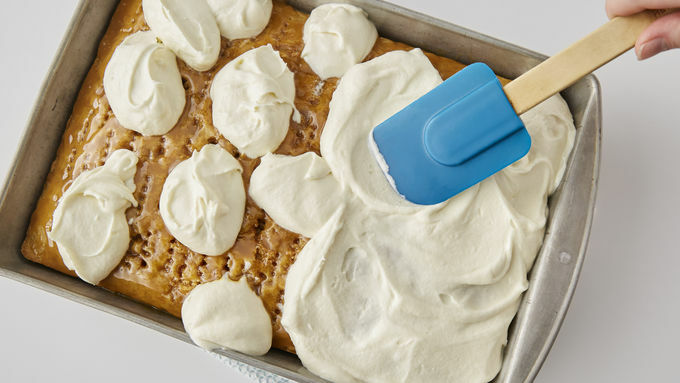 In poke cake recipes, be sure to pay attention to what poking tool is called for. 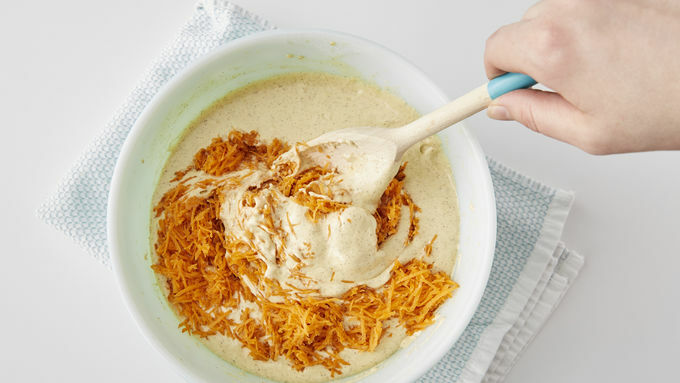 Depending on the filling, the recipe may call for the end of a wooden spoon for thicker fillings or the tines of a fork for thinner ones. Time is of the essence. Follow the recipe instructions for when to pour the filling on top. If the cake has cooled off too much, the caramel sauce will have a harder time filling the holes and it won’t be soaked into the cake. If you do wait too long, tap the cake pan on the counter a few times to help the filling flow into the pokes. Poke cake fillings can vary: gelatin, pudding, sweetened condensed milk, caramel topping or even fruit puree are all delicious options. If the recipe calls for a 13x9’’ pan, poke the cake 50-60 times to make sure each slice of cake has filling—but don’t go overboard. Too many pokes can result in a fractured cake that will be extra fragile when cutting.